I was browsing the Microsoft Tech Community last night and came across a post by a user saying “Is it possible to stop Skype from announcing Mute Off in meetings” as it was causing them to miss conversations or a chance to interject. This behaviour is not native Lync / Skype for Business. When you go into a mute state the default sound is played, which is a emphasised beep. You can find the actual WAV file in C:\Program Files\Microsoft Office\Office15\15.0\Media folder (or wherever your Office program is installed). The file you are after is LYNC_muting.wav. When you come off mute, Lync / Skype for Business doesn’t actually play a sound at all, meaning you can interject immediately and miss no parts of the conversation. 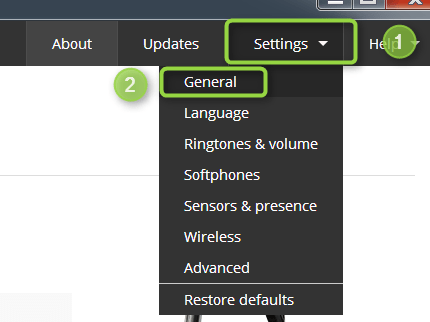 If you hear the words “Mute On” or “Mute Off” then there is an additional control layer on top of the default behaviour. This is delivered by your headset manufacturer. 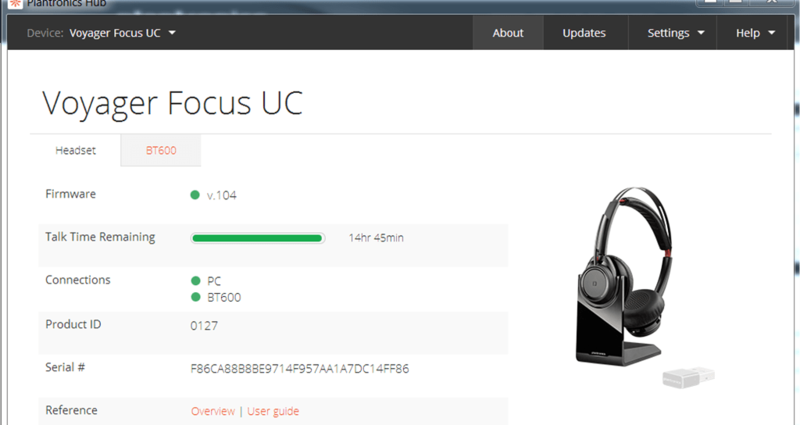 I have a Plantronics Focus UC and UC5200, both devices play the “Mute On” and “Mute Off” message. This is built in to the firmware on the headset itself. When you have installed the hub, your device will be auto detected. The hub will detect both the headset and any bluetooth adapter (e.g. BT600). make sure that you have your headset selected and that your headset is powered on. 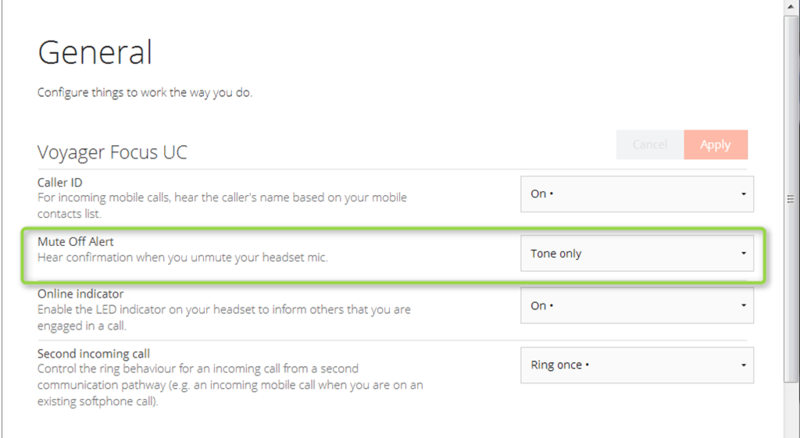 In this window you will notice a settings called “Mute Off Alert” The default setting is Tone and Voice. Change this to Tone Only and press Apply to commit the settings. Once the settings have been applied, the next time you come off mute in a meeting you will hear just a beep. Unfortunately there is no setting for “Mute On”, and we can’t eradicate the “Mute Off” beep to silence, but at least this helps. As there is no visual indicator on the headset itself, it is usually difficult to keep track if you have just put yourself on mute, or the opposite, you are no longer muted. The tiny BT dongle is not always in clear line of sight to see the blue versus red status light. So I think the voice prompt that says you are “no longer muted” actually makes sense, and personally would never consider to turn it off. Especially not after a couple of “whoops, wasnt I on mute guys? ?” type of accidents. The post you read was probably actually for someone calling in to a Skype for Business call via a phone (call me at …). When doing that and muting yourself in the application you get a long message saying (very slowly) “You have been muted. To unmute yourself press *6”. It takes about 3-4 seconds for it to finish and while it is happening you can’t hear the conversation and can easily miss a chance to chime in on a specific piece of the conversation.